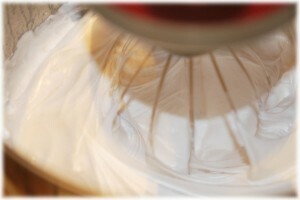 Add half cup of the cold water to the the 3 pkgs of gelatin in your mixer bowl. I recommend using a stand mixer as you are going to have mix this for around 12 minutes (or perhaps longer) and using a hand mixer could change this from easy to something else entirely. 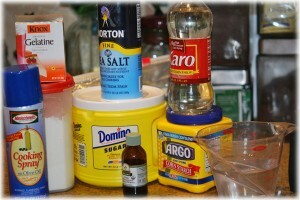 Then put the other 1/2 cup of water, sugar, corn syrup and salt in a sauce pan over medium high eat. Cook covered for 3 or 4 minutes. 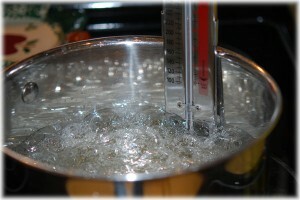 Uncover the pan, put your candy thermometer into the pan and continue cooking until the mixture gets to 240 degrees (F). As soon as it gets to 240 degrees, remove it from the heat. I found it took longer than the recipe said (7 to 8 minutes) but I also had to fiddle with the heat and turn it up so I may not really have had it on medium high heat initially. It didn’t seem to make any difference any of the times I made it, however. Once you take it off of the heat, take your candy thermometer out of the pan. Turn the mixer on low and pour the hot mixture into into the gelatin in the mixing bowl. When all of the hot syrup mixture is poured into the bowl, turn the mixer on high and whip (use your whisk attachment) until it is thick and fluffy. The original recipe said until it is lukewarm. I thought the bowl was still hotter than lukewarm, but it was cool enough for me to handle it. About 12 minutes. I don’t know how long I would have to beat it to get it lukewarm. Add your flavoring the last minute of whipping. 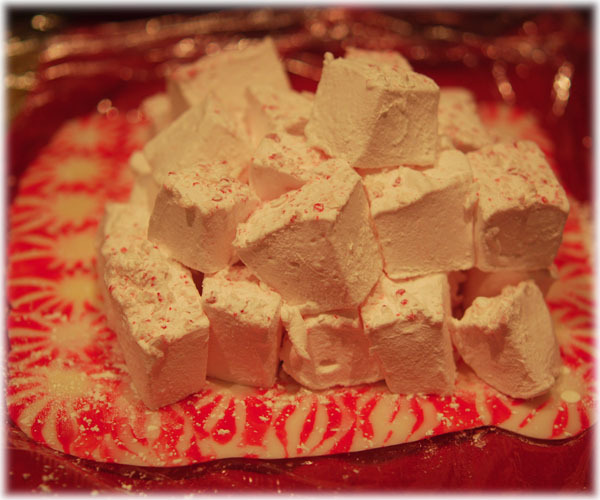 I also added 2 drops of red food coloring to the peppermint coloring and it came out a beautiful subtle pink. While it is mixing you should prepare your pan. The original recipe said to use a metal pan. The only 9 X 13 inch pan I have is pyrex and that’s what I used. I had no problem, altho you can’t bang it on the counter (mine is granite!) to move the cornstarch/powdered sugar mixture around. Spray your pan with non stick spray –sides and bottom but don’t overdo it. Mix 1/4 cup to 1/2 cup each of cornstarch and powdered sugar and blend well. The original recipe called for 1/4 cup of each but I found I needed more. If you have extra left over you can put it in a bowl with a lid and save it for your next batch. 🙂 Use this mixture to coat your pan, bottom and sides WELL. I didn’t coat the first time well enough. I really don’t think you can overdo this. The marshmallows are really sticky and this will make them come out of the pan. Reserve the rest of the cornstarch mixture for later. When done mixing, pour mixture into the prepared pan, using a lightly oiled spatula or large spoon to help spread it evenly (although it’s ok if it’s not perfect–mine weren’t and no one complained). If you want to color the marshmallows now is the time to do this. You can drop food coloring on top (red is really pretty on the cinnamon) and take a toothpick and swirl around until it looks pleasing to you. Let them sit at least 4 hours, but overnight is fine. 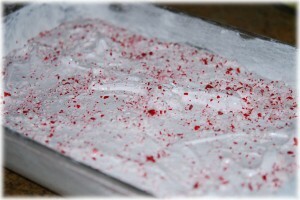 Then, put some of the cornstarch mixture on a piece of wax paper, parchment paper or cutting board. Lightly oil a pizza cutter and dust it with the cornstarch mixture (be careful not to cut yourself –don’t ask how I know). 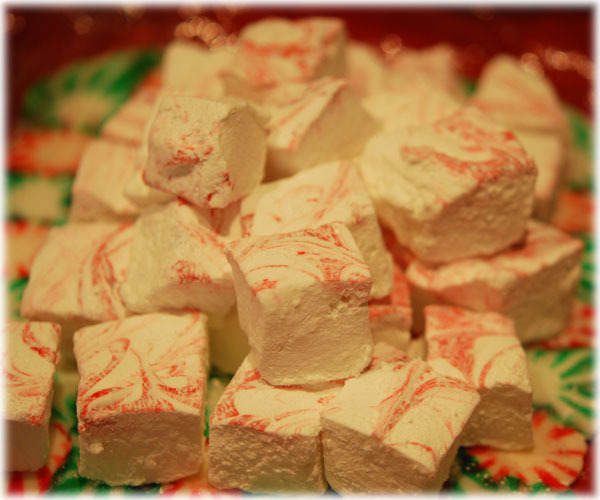 If you have trouble getting your marshmallows out of the pan because you didn’t put enough cornstarch mixture into the pan don’t worry, you can work it loose with a knife dusted in the cornstarch mixture. Cut into strips and then into squares, about one inch. Be careful because they will self heal if you allow them to touch. I found that as you cut the strips, it’s best to sort of pull them away from each other and rub them into the cornstarch right away. 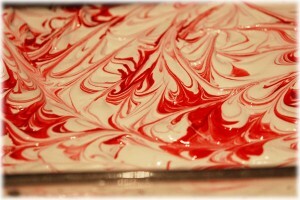 Then cut that strip into squares and drop them right into a bowl with the rest of the cornstarch and toss them lightly. Then do the next strip. Everyone probably finds a way that works for them, but this way I didn’t have a big problem with them sticking to each other (after making a couple of batches). Once they are dusted on all sides with the cornstarch, you can put them into ziplocks and into the fridge. They keep about 3 weeks according to the original recipe. Good luck having them around that long!